When I ventured out to The Rock Barrell last weekend, I was stoked to see some gorgeous mineral specimens and escape the heat (hello 100 degree days Dallas!). 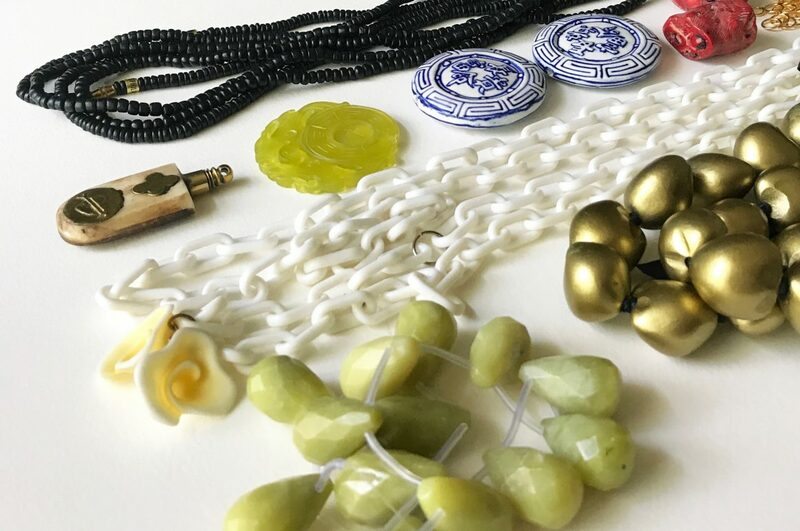 What I didn’t expect was to find was bold, eclectic jewelry components that make this local Dallas shop a cut above the average bead store. What I found most inspiring about The Rock Barrell’s selection was that it had an undiscovered, self-unaware, quirky vibe; I find that now that the craft stores are fully immersed in the Pinterest culture, unexpected DIY ingredients are hard to find! Read on to see what I selected to make my oversized, “a lot of look,” DIY statement necklaces! 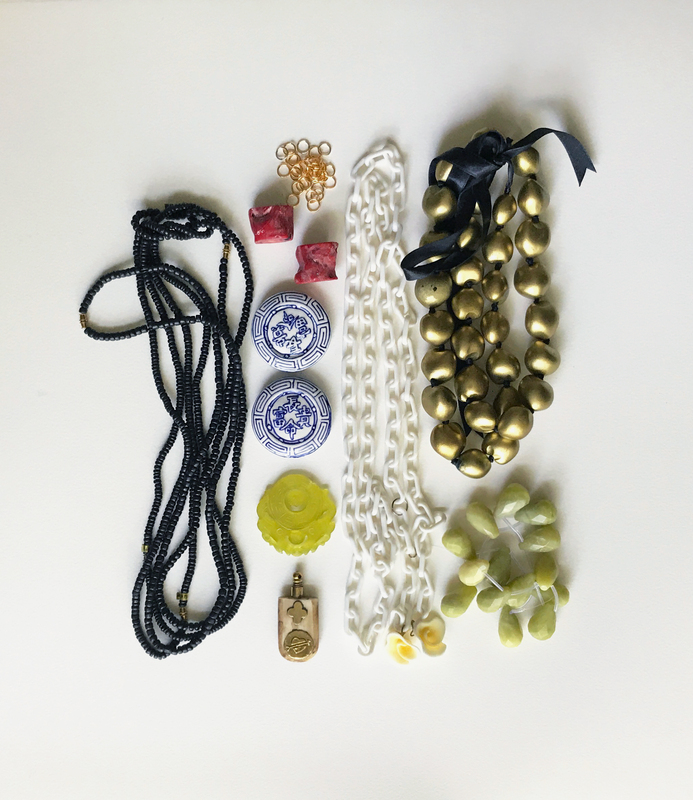 I roamed the aisles of The Rock Barrell with my bead tray picking up and replacing stone locust pendants, African brass amulets, and strands and strands of bone beads until I made my final assortment. The citrine hued carved pendant was my first selection, and after it hit the tray the rest of my supplies fell right into place. I have jewelry pliers, wire, eye pins and crimp tubes (a must with all those tiny black clay beads!) at home, so all I needed was jump rings and my enviable elements. I didn’t find a place for the gorgeous gilded bean beads, but they’re strung so nicely on black satin ribbon, I think I’ll just add them to my summer wooden jewelry wardrobe. I’m kind of in love with the first of my DIY statement necklaces; an Iris Apfel inspired, global creation. While stringing all those tiny clay beads, I considered amending my original plan for a choker length, obviously, I’m so glad I stuck with it assisted by the extra 2 hours of Netflix (Friends from College anyone?)! 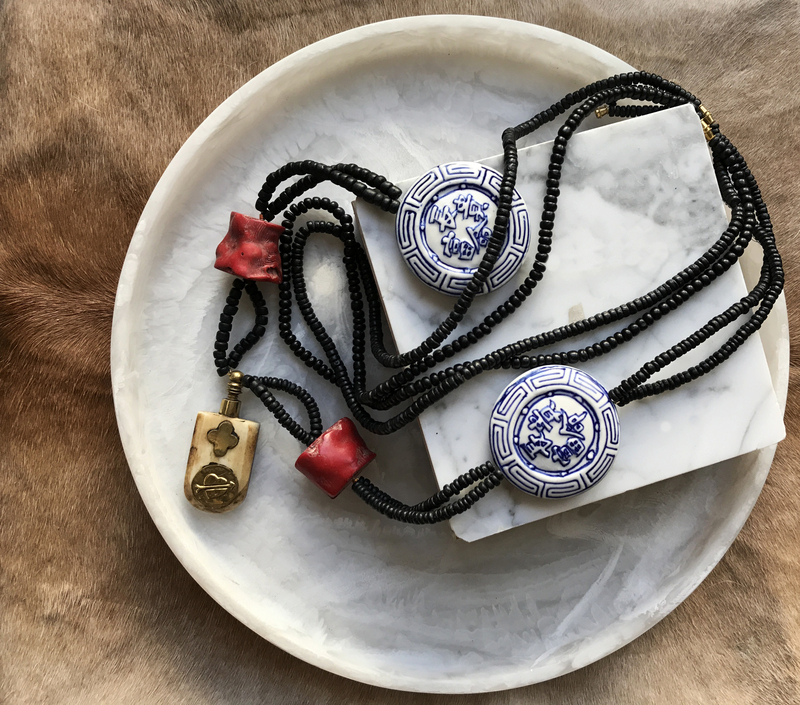 I adore these coral beads (sold by the gram) and the blue and white porcelain pendants; the mix of origin and material is what does it for me on this finished piece, and I’m psyched to pair it with my breezy black eyelet tank. This delicious sea creature of a necklace is a stunner on. It’s borderline too much, which means it’s 100% right with a slouchy tee and jeans that have seen one too many wearings since laundry day. When I saw this white “vintage” chain among the vibrant, multi hued strands of stone beads I knew it was coming home with me. I secured the layers with jump rings and strung the serpentine tear drops with eye pins. 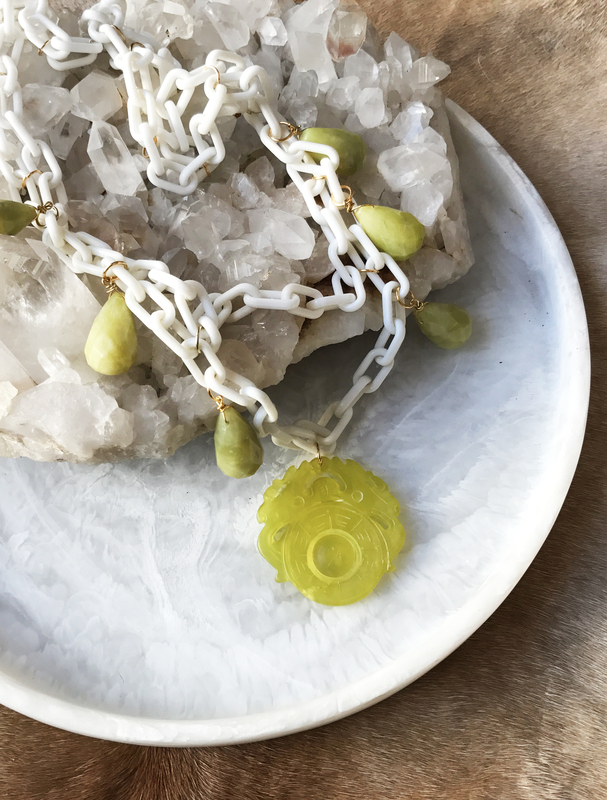 It has a vintage, one-of-a-kind look, and in the case of these DIY statement necklaces, they are! I was left wondering, after contemplating going back for more chain- is this “new dead stock” or new and just marked vintage because of its aesthetic? Either way, give me white plastic chain all day! Love the citrine! Picture of you wearing it? ?